Tricia is a single mom whose generosity improves the lives of many people in her community. On top of working hard to provide for her 14-year-old son, Xander, Tricia also volunteers for a local organization that partners underprivileged youth with adult mentors. Tricia, Xander, and their buddy are all smiles during their first visit to the amusement park. Tricia and Xander spend a lot of time with their eight year old buddy, making sure that he has nutritional foods like fresh fruit available and providing him with access to activities he ordinarily wouldn’t be able to participate in. This is an important way for their buddy to focus on having fun and learning new things, since he often needs to stay home and help take care of his baby niece when he’s not in school. When summer came around, Tricia was worried about making plans for Xander while she worked full time. All of the camps she looked at were too expensive, but she also did not want him to be home alone and bored all summer. When Kristine heard about this, she wanted a way to help Tricia, Xander, and their buddy to have a fun summer. 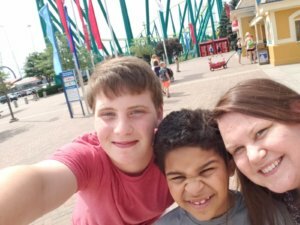 Kristine had an idea – a great way to provide a summer full of fun would be with three season passes to the local amusement park for Tricia, Xander, and their buddy. Tricia and their buddy had never been to the amusement park. Xander had gone with Kristine and her daughter once and loved it. 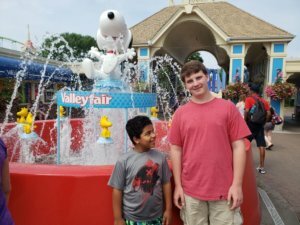 Xander and his buddy having fun at the amusement park. The season passes included the cost of parking and admission, so that Tricia would not need to worry about the cost of visits to the amusement park. Since Xander would have his own pass, he could go to the amusement park with Kristine and her daughter while his mom was at work, too. 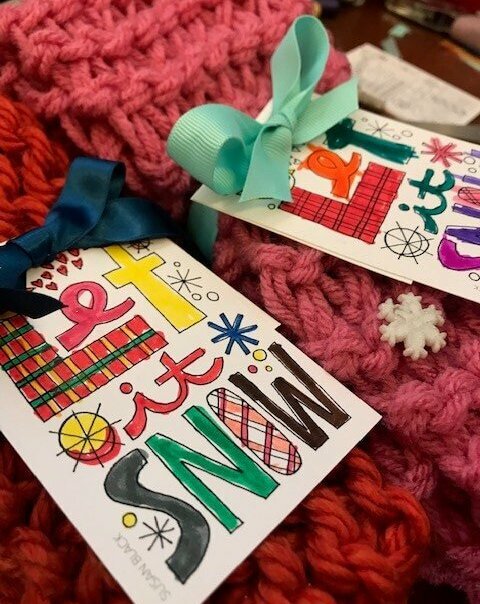 Random Acts thought this was a great idea and were thrilled to help make it a reality. But wait… there’s more! Following Kristine’s suggestion, Random Acts sponsored a meal pass for Xander. This pass covered the cost of one meal every four hours while at the amusement park. Since those sunny summer days can end up sweaty, and staying hydrated is important, Random Acts also purchased two drink passes for Tricia and Xander to use (and to share with their buddy, of course). Tricia, Xander, and their buddy were able to use these passes all summer long, since the park stays open through Halloween. Between the rides and the water park, there is more than enough to do during multiple visits. Tricia and their buddy were able to go at least four times during the summer, and made full use of the beverage passes each time. Their buddy loved all of the rides! Xander went even more frequently and enjoyed being able to use the food pass during his visits. As you can see from the pictures, it was a fun summer escape for everyone. Do you know someone like Tricia who could use a little kindness? We may be able to help! Learn more about our sponsored acts here.